Tucker here. I’m taking this Friday to opine about the Friday Fill ins # 143. 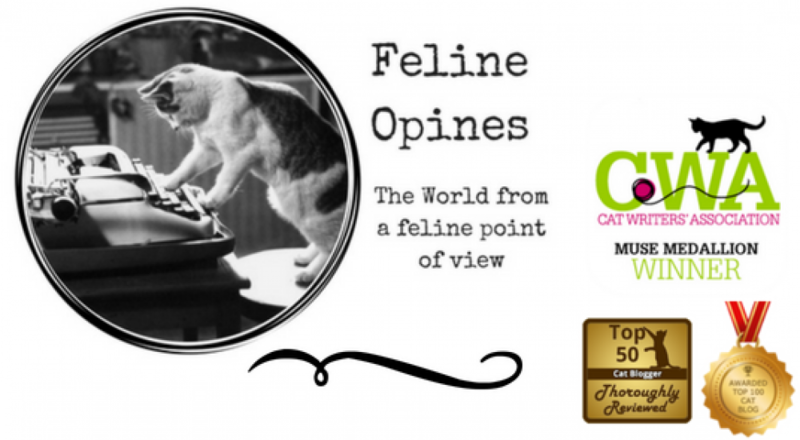 I hope you enjoy my answers and, as this is a blog hop you are invited to post the answers from your blog with one of the two hosts, 15andmeowing and Four-Legged Furballs . If you’d rather opine about your answers in the comments of this post, we’d love to hear from you. 1. I want to make Lily a little braver so that she doesn’t run from Alberto and Oliver when they chase her. 2. My eyes are a bit crossed. 3. A day in my life always includes naps with a buddy. 4. Good things happen to those who sit on a stool on the counter and wait patiently. This entry was posted in cat behavior, Cat blogs, Cat Humor, Cat writers, Cat Writers Muse Award winning blog, cats, Pet blogging, Siamese cats and tagged cats by th window, Siamese cats by Feline Opines. Bookmark the permalink. Those were fun answers Tucker! Excellent advice for Lily, i hope she takes it. Also i hope you did get a taste of whatever was cooking. Lily is still cowering but I managed to guilt trip The Female Human into giving me a treat. Tucker you did a great job filling in. I think you are a good teacher for your sister, a nice nap buddy for Oliver, and a very patient guy when it comes to waiting at the counter for a treat. Mom and I also think you are adorable – that’s a good thing right?? Thanks to you and your mom for the kind comments Teddy! My sad look gets me all the treats a feline could want! Tucker, your eyes look like mine used to…I have what humans call, “a lazy eye”, and my brother and sister had the same issue. All had surgery to correct it cosmetically, but when I’m really tired, my one eye wanders off a bit. Therefore, I have double vision, but my eyes have learned to compensate by one taking over when I drive, and the other when I read, etc. Crossed eyes are beautiful! The Female Human says my eyes add to my charm. I’m glad you got your eyes fixed! Hello, handsome Tucker! Thank you for joining in on the Friendly Fill-Ins! You are such a sweet boy, giving Lily advice on how to be brave. Around here, little lady cat Eddy could use some advice like that, too. And we bet lots of good things happen when you sit on that stool so adorably! Purrs! Ah yes, good treats come to those who wait at the counter! Why thank you! The Female Human calls me “sweetie” all the time. It’s not very manly but I apurreciate that she loves me!